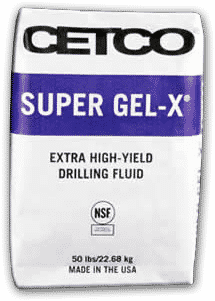 Cetco® Super-Gel X® is an easy mixing, high viscosity 200 bbl. yield freshwater drilling fluid. Produced from the highest grade Wyoming sodium bentonite, Super-Gel X® is certified to NSF/ANSI Standard 60, Drinking Water Treatment Chemicals – Health Effects.